Self-catering log cabins are perfectly equipped for a comfortable stay amid the wilds of nature. Each log cabin comprises of two bedrooms (bedroom 1 has one double bed and bedroom 2 has one bunk bed – double/single). Guests must supply their own sleeping equipment – pillows, duvets, bed linen, towels, tea towels. The cabins also contain a private bathroom, fully-equipped kitchen, living room and outdoor area, as well as have a laundry facility nearby and onsite parking to ensure your log cabin is a home away from home. The Fisherman’s Lodge has the same amenities as the log cabins. It is located beside all the other two-bedroom log cabins. In this unit there is one bedroom rather than two bedrooms. In the one bedroom there is a double bed and out in the living area there are two single foldout beds. This cabin holds up to four people or 2 adults and 3 small children. 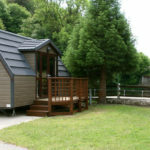 The Glamping Mini Lodges overlook the Avonmore River on site. The mini lodges can accommodate up to 5 people (or 2 adults and 4 young children) and provide a safe and comfortable alternative to camping! They each contain two double beds, one single bed, picnic table, small fridge, kettle, lights and heater. There is no bathroom or kitchen in the mini lodges. The toilets, showers, camper’s kitchen and laundry room are just a few feet away. If you are renting a mini lodge, then you must supply your own sleeping equipment such as pillows, sleeping bags, linens, duvets and towels. Pets are not allowed inside the mini lodges. Smoking is also not permitted indoors. 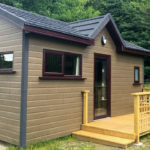 The mini lodges can be booked nightly all season long, except for bank holiday weekends. The Loft House Glamping Lodges and Loft House Ensuite Glamping Lodges overlook the Avonmore River on site. 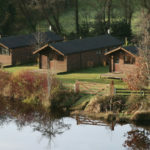 These lodges can accommodate up to 6 people and provide a safe and comfortable alternative to camping! These lodges contain two double beds, two single beds, picnic table, small fridge, kettle, lights and heater. 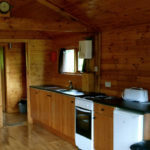 There is no kitchen in these lodges and only the Ensuite units have a toilet and sink. The amenity block is just a few feet away, which contains the toilets, showers, camper’s kitchen and laundry room. If you are renting a glamping lodge, then you must supply your own sleeping equipment such as pillows, sleeping bags, linens, duvets and towels. Pets are not allowed inside the glamping lodges. Smoking is also not permitted indoors. These lodges can be booked nightly all season long, except for bank holiday weekends.